While Spring is here, and Summer is almost upon us, there are still cool evenings when we crave comfort foods! Salsas, grilling and light salads will be here before we know it, so let’s enjoy a few more warm and cozy dishes while we can! My kids love this one, and all I have to do is add something colorful, you know, like a green vegetable, and I’ve got a complete meal! I love this because it only takes about 15 minutes to get it into the oven, where it magically turns into something that tastes like I spent hours on it! It’s flavorful, hearty, and of course, incredibly delicious! Cook the pasta in a large pot of boiling, salted water until it’s al dente — just tender but still firm to bite. 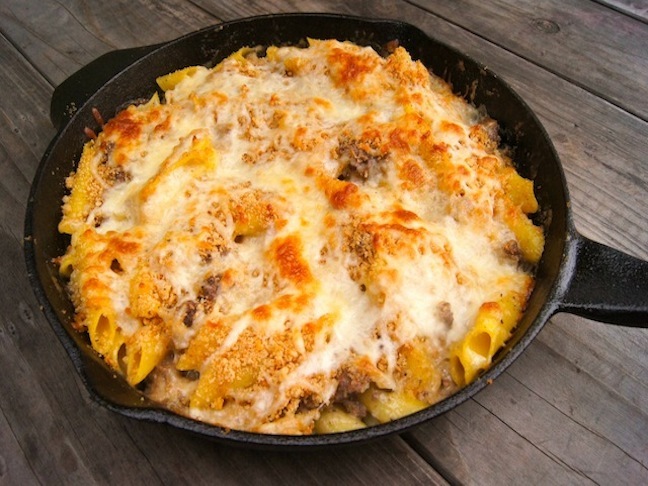 While the pasta is cooking, coat the bottom of a medium to large, oven proof skillet (cast iron is perfect), with olive oil and place it over medium heat. Add the onion and cook until it’s soft, about 4 minutes. Mix in the thyme and cook until it’s aromatic, about 30 seconds. Then add the beef and stir every so often, until it’s cooked through, about 5 minutes. Melt in the butter and then stir the tapioca flour in evenly. Let this simmer gently on a very low heat for a couple of minutes. When the pasta is done, add 1/4 cup of the water it cooked in, to the beef mixture. Then drain the pasta and immediately add it to the beef mixture as well, along with the Gruyere cheese. Mix to evenly combine all of the ingredients and season to taste with salt and pepper. Evenly sprinkle the top with the Parmesan and bread crumbs and place the pan directly in the preheated oven. Bake until it’s golden brown and sizzling, about 20 minutes. Let it sit for about 10 minutes out of the oven before serving. I save the ends of my gluten-free bread, toast them, and then blend them finely in the food processor with the blade attachment.